Have you ever wanted to do something, but just didn’t know how it would turn out? This is how I felt when I saw an email about a Fun Run sponsored by GoGoSqueeZ at the Disney Social Media Moms Celebration. I first learned about Fun Runs at Disney last year at their On the Road Conference. I was totally intrigued, but am not a runner so I came to terms with the idea that I would probably never do one. Sure I run for the bus or train, but couldn’t do a ½ marathon or 5K without training. I’m more of a why run when you can dance kind of gal! Then I saw the Fun Run was only 1 mile. I can do that. I mean the train station is a mile away and I walk that so I signed up. It was a 6am run on Mother’s Day, but getting the chance to run through Epcot without anyone there was something I couldn’t pass up. I woke up early (5:15am) and was out the door to meet about 80 other friends to run/walk to the Butterfly Garden in Epcot. There were some veteran runners, some novice and some people who were planning to walk. We were given GoGo SqueeZ capes to wear and I loved feeling like SuperMom ready to conquer this run. I met Erin and we decided to do the run together. We ran till we got to the front of Epcot and then took to walking as we started snapping pictures of an empty and dark Epcot. I loved all the encouragement and Mother’s Day wishes from the Cast Members and GoGo SqueeZ team they were also handing us packets to keep our energy up. Seriously so tasty to get a cold appleapple right as we walked into the park. As we ended at the Butterfly Garden we were given medals, wished a Happy Mother’s Day and of course they had water and more GoGo Squeez! We then took some time to enjoy the peace of the park and our accomplishment. I got to walk back with Sarah and as we approached the Yacht Club we ran into a few other friends Esti, and Krista. Of course the sun was rising so we took advantage of an empty dock and did some photos. We are social media moms after all! The biggest thing I took away from the Fun Run was I really can do anything. It was a good reminder that it’s okay to do something out of your comfort zone. You never know what will come of it. For me it was new friends and the pride that I can tell my kids it doesn’t matter how you finish just as long as you do. 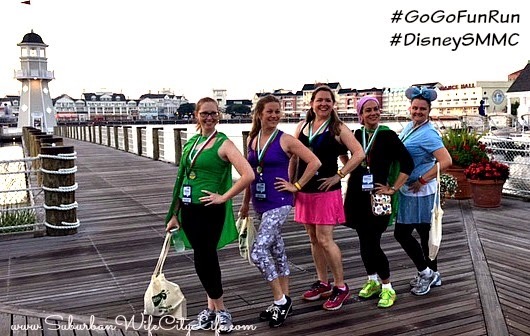 Disclaimer: I was invited to attend the 2015 Disney Social Media Moms Celebration. I paid a conference fee to attend and was provided with discounted and complimentary items. As always all opinions are my own.